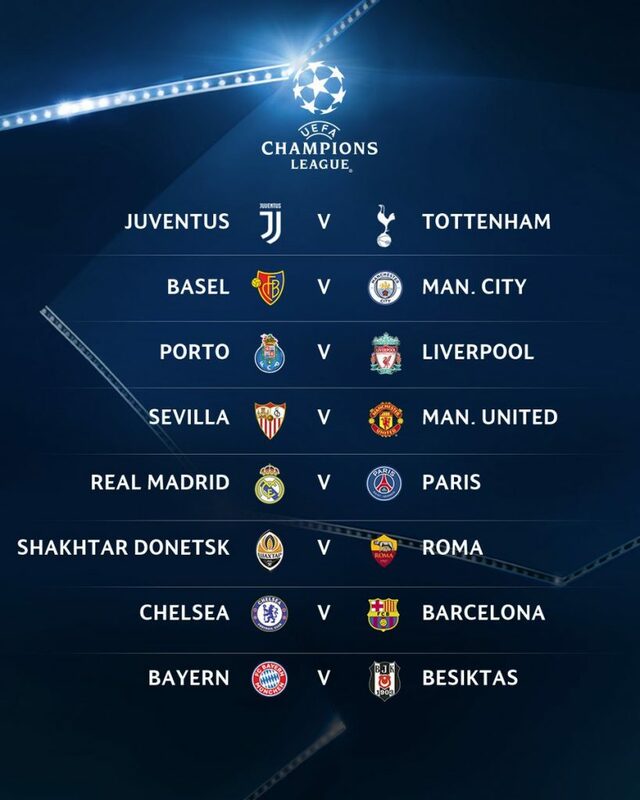 Monday morning at UEFA headquarters in Switzerland, the 2017-2018 Champions League Round of 16 draw was revealed. The special guest was Xabi Alonso, a former Legend of Liverpool, Bayern Munich, and Real Madrid, in which are all playing in the Round of 16. This is the first time that all five English Premier League teams have successfully made it to the Round of 16. There were a lot of questions whether the league is competitive enough to deserve four tickets to the tournament, and they are currently proving that they are qualified to win them. Also, football experts also argue that it has been a long time since there were as many big games as this year’s Champions League Round of 16. The age difference between these two teams are clearly shown in the rosters. The average age of players in Juventus is 28.8, which is the oldest among all teams in the Round of 16. On the other hand, Tottenham Hotspurs’s average age is 26.1, which is the third youngest after FC Basel (25) and Liverpool (25.6). Going into specific details even more clarifies the age difference. Juventus’s legendary goal keeper Gianluigi Buffon is 39, close to facing his retirement. His defenders, Giorgio Chiellini (33), Andrea Barzagli (36), and Medhi Benatia (30) are going to face young strikers in Tottenham, like Son, Eriksen, Kane, who are between 22 and 25 years old. In fact, the only players that are older than 30 are Hugo Lloris (goal keeper) and Mousa Dembele (central-defensive midfielder). This match should have been saved for at least the semifinals. The two teams have met way too early. It is true that PSG had bad luck in the Round of 16 draw for the past years. Last season, they faced Barcelona, winning the first leg 4-0, but was defeated 1-6 and has been recorded as one of the most dramatical comeback from Barcelona in the UCL history. In 2014-2015 and 2015-2016, they were defeated by Barcelona and Manchester City again. Now, they are facing the defending champions. Their situations are very similar. Real Madrid is composed of Star Players, influenced by the transfer policy “Galáticos” which is to buy star players from any teams around the world. PSG, has joined this race. Based on their investment from Qatar in 2010, they have been buying several star players. This year, they successfully transferred Daniel Alves, Neymar and Mbappe, making the team one of the strongest teams in the competition. These two teams have played against each other in 2015-2016 Champions League Group Stage, in which it was a 0-0 draw in PSG home and 1-0 win for Madrid in Santiago Bernabéu. Real Madrid and PSG are considered as strongest teams in attack, PSG scoring 25 goals in the group stage and Madrid scoring 17. However, two teams are currently facing defense problems, caused by overage of central defenders and injuries. Therefore, the game is expected to have a lot of goals. This is the 13th time these two teams meet in a European Tournament. The record is slightly in favor of Chelsea, with 4 wins, 5 draws and 3 loses. When they faced each other for the first time in 1999-2000 Champions League, Barcelona was the winner. The rivalry between these two teams began to light up in 2008-2009 Champions League Semi-Finals when Chelsea drew with Barcelona in Camp Nou by 0-0, and drew with them again by 1-1 in Stamford Bridge. By away goal rule, Barcelona qualified for the finals, but there were questions regarding the fairness of the referee, and Chelsea’s star striker’s action was cursing towards the camera was controversial. The latest match between two teams is 2011-2012 Champions League Semi Finals when Jose Mourinho was Chelsea’s long run manager. The writer was watching the match in a friends’ house, when Chelsea qualified with Fernando Torres’s buzzer beater at the last minute of injury time. Interestingly, according to the records, the world’s finest player, Lionel Messi has not scored a single goal against Chelsea. The tactic battle between Conte and Valverde is definitely one of the most spectacle attraction, but the football experts are also interested if Lionel Messi would break his jinx against Chelsea.